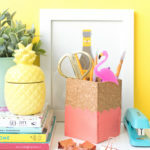 If there’s one thing I love more than any other home decor item, it’s office supplies. I swear, I have so many office supply trinkets that I need to get much bigger office. It’s getting out of hand, but I don’t expect to stop anytime soon. 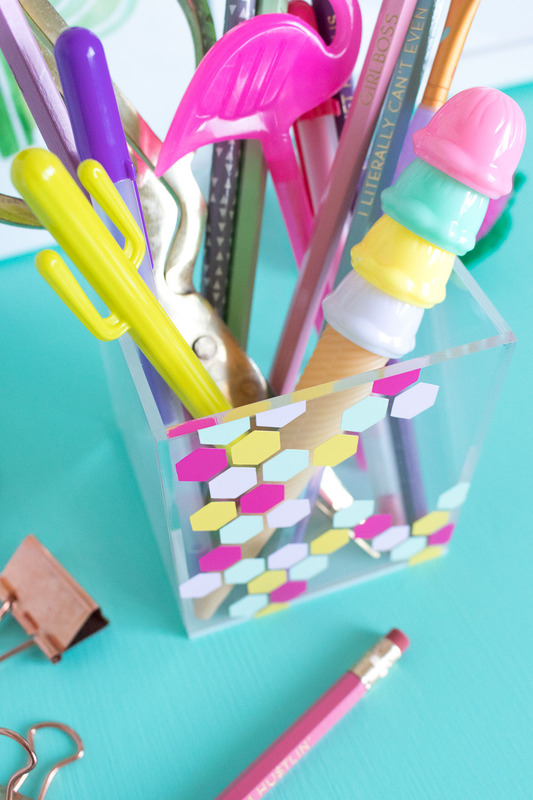 Adding to the mix, I made this colorful DIY honeycomb acrylic organizer using a cute acrylic container I picked up in the Target Dollar Store section – that stuff is gold! To decorate it, I used my all-time favorite craft supply, vinyl. 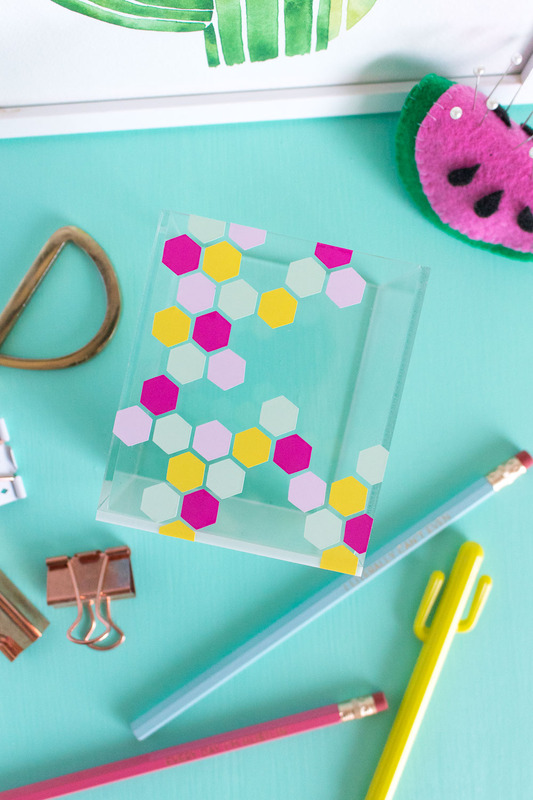 It was so easy to make with my Cricut machine, which you know I swear by, and I love this honeycomb pattern with a variety of colors. 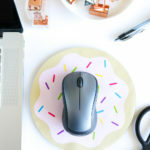 Can you spot some other Club Crafted DIYs in that photo? 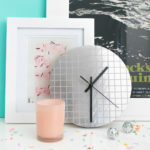 That watermelon pincushion is one of my fave DIYs, and that woven paper art is a project from Curbly! 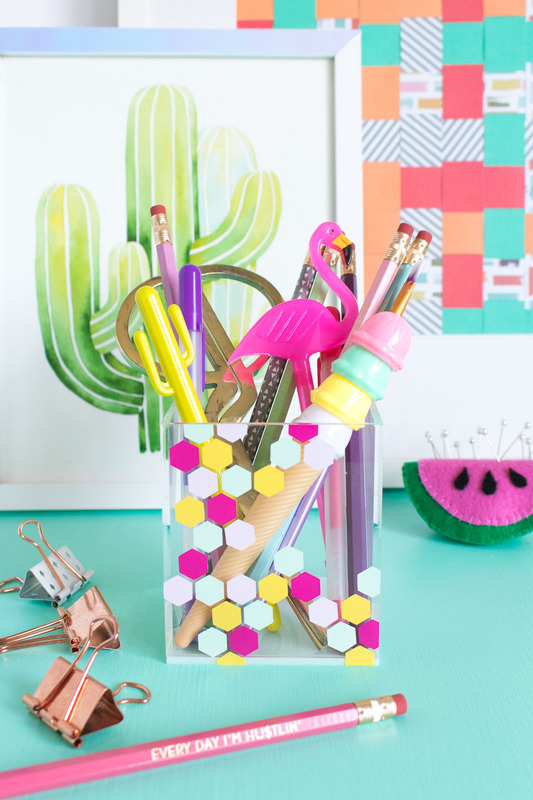 Oh, and the frame around that cactus print is a DIY that’s coming soon too! 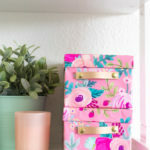 I love acrylic, but it can often be expensive, which is why I grabbed this desk organizer so quickly when I saw it was only $3. 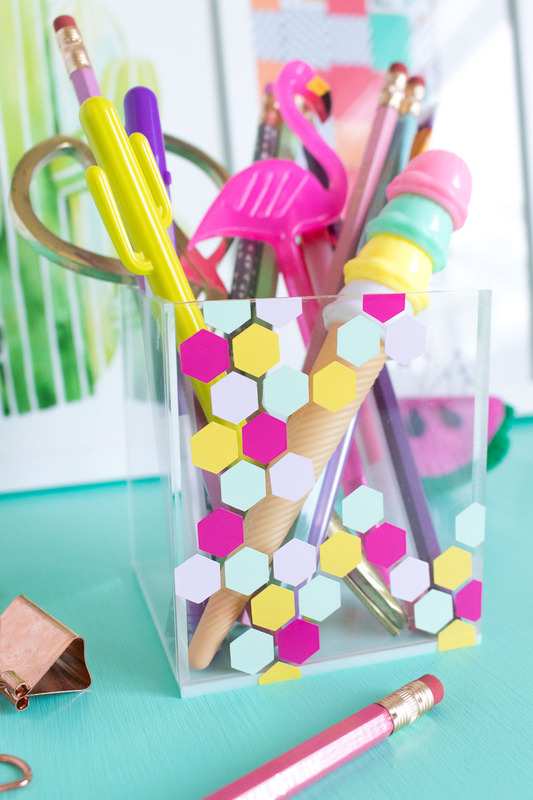 I simply cut out the vinyl in extra small pieces and used craft tweezers to arrange them in a random honeycomb pattern. 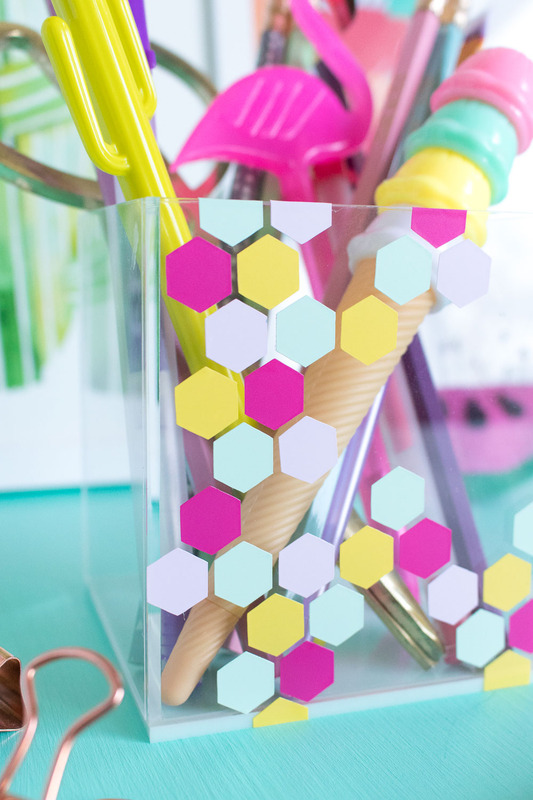 I love the look of hexagons together, and by mixing up the colors, I think it can be very eye-catching. 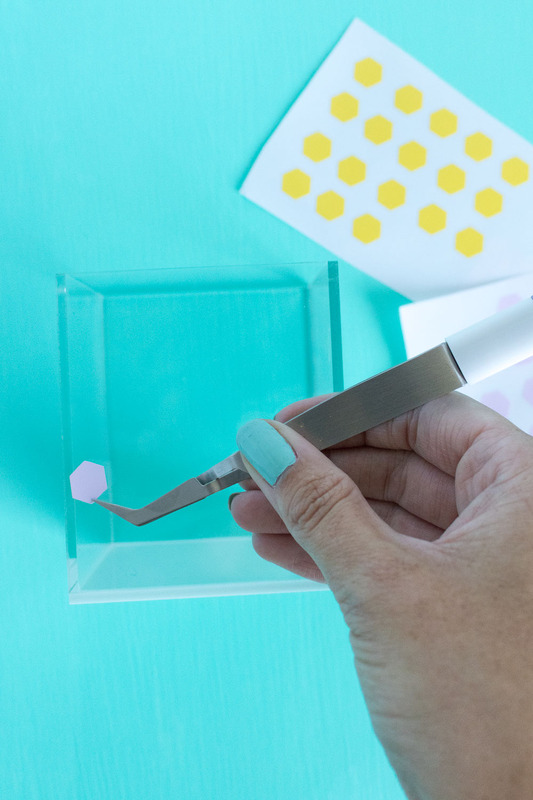 Plus, who doesn’t love a simple DIY?! 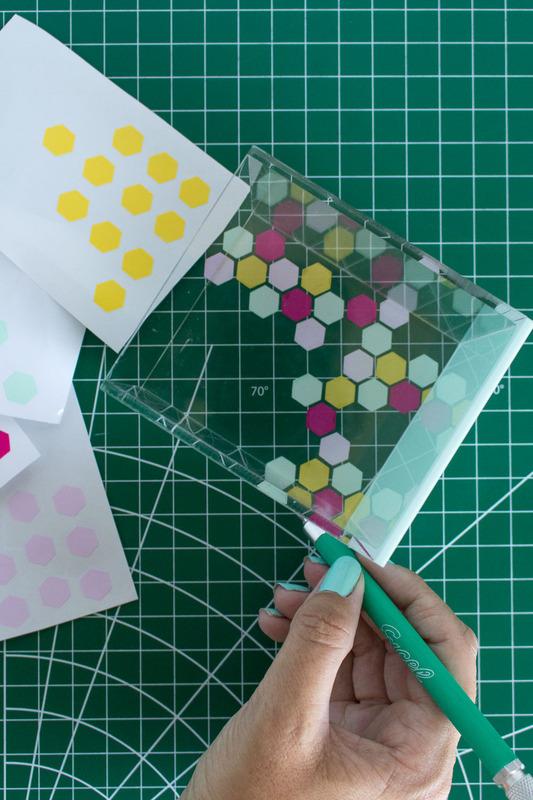 Step 1: Cut out hexagons that are only about a 1/2-inch wide. A cutting machine is easiest, but you can do this by hand with a hobby knife if desired. Cut multiple colors – I used four. 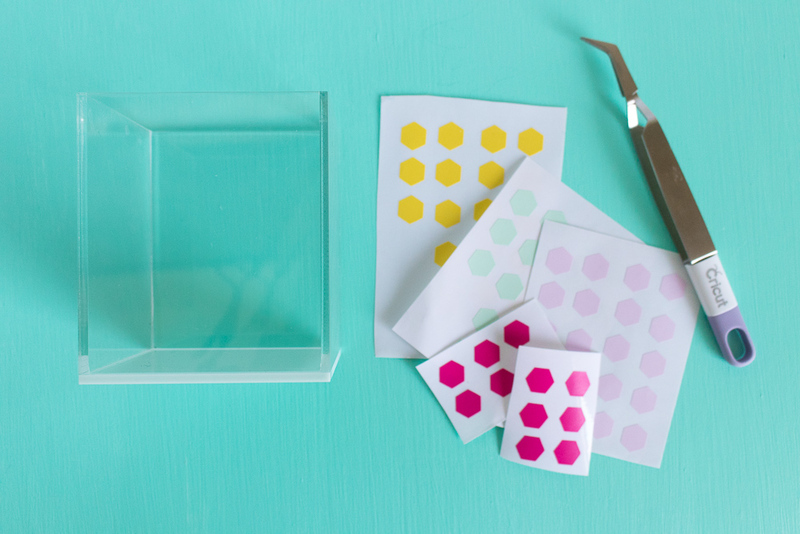 Step 2: Carefully peel the vinyl hexagon stickers from the paper with craft tweezers and position on the acrylic container. Repeat with various colors, positioning them very close together but not touching. You may follow a specific pattern or make the honeycomb appear random. 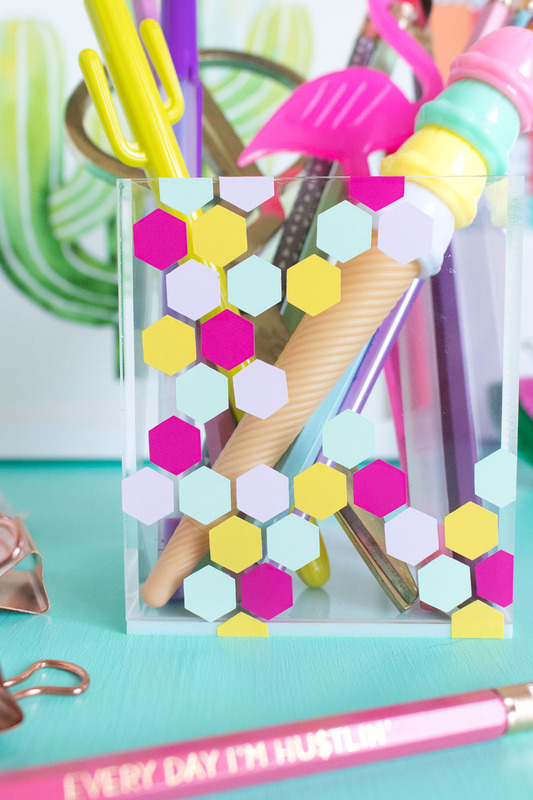 Step 3: For the hexagon pieces that reach over the edges, flip the container over face-down on a cutting mat. Use a hobby knife to cut along the edge so that the vinyl is flush with the container. Now your acrylic organizer is ready to use! Fill it up with pens and scissors and display it on your desktop. Mine is currently playing house to all of my goofy pens – but the flamingo one is still my favorite! Happy crafting! Loving it. Just picked up a hexagon punch, and wondering what to do with it. Your colours are pretty! I love working with vinyl. I wish we had Target here. Sigh. Ooo a punch would be perfect for this! I can’t believe you don’t have a target nearby…I thought they were everywhere!